Sarah Sieradzki is a native New Yorker who received her BFA at the School of the Art Institute of Chicago in Photography. 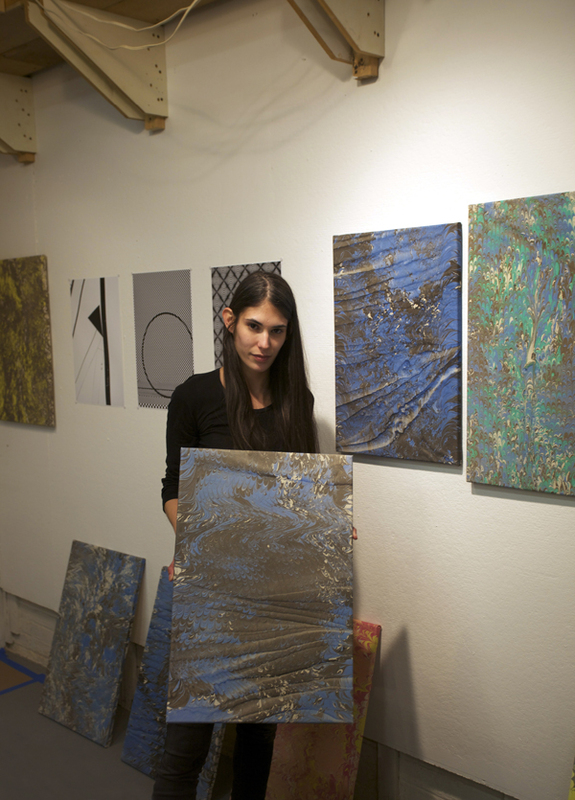 She is currently living and working in East Williamsburg and delving into the world of painting using photography as her tool. 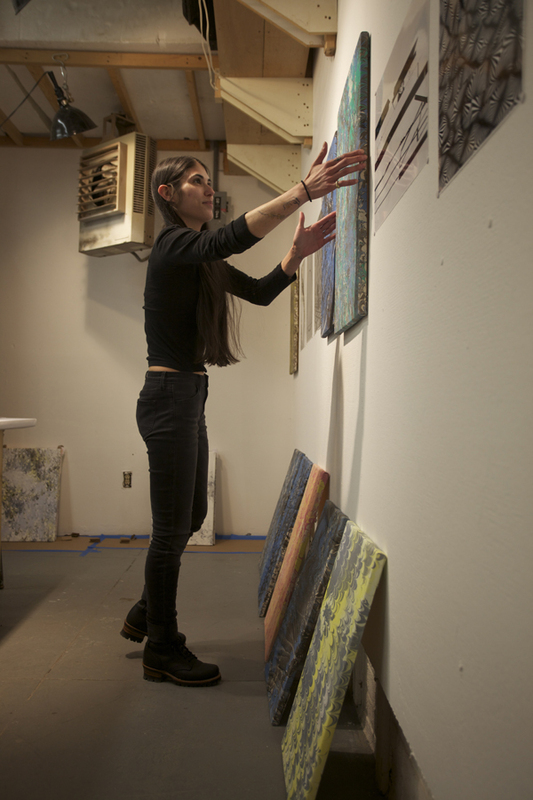 Her studio visit took place in an immaculate basement space shared with one other artist. F: You switched over to digital photography. Has that changed your process? SS: Definitely, that might be why all of them are really graphic. That [switch to digital] definitely changed the way I was making photos. 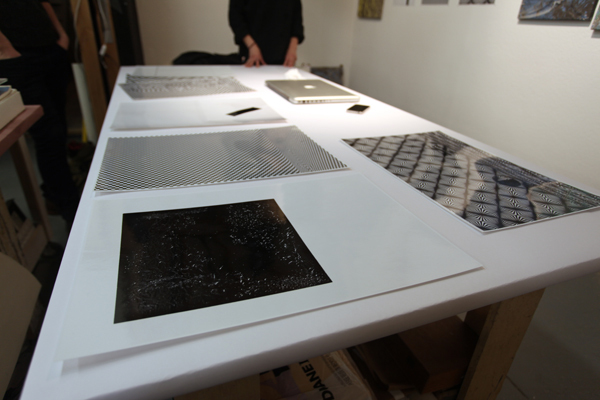 When I started the project, I was using glass objects and shooting large format. It felt slow and too specific so I changed to digital and with digital, I was able to make more images than I was able to with film because with large format, it’s only so many images per session. Shooting digital relieved an anxiety that I associate with film. I feel more comfortable not thinking twice about a shot … but that’s before the editing, which also changed the way I thought about making photos. Before this work, I did this book. F: Yeah, can you talk about your book a little bit? SS: I did this book with a publishing company called Peradam and they’re working with a bunch of artists right now. The book is composed of these haikus I wrote when I was working in an office as a secretary. 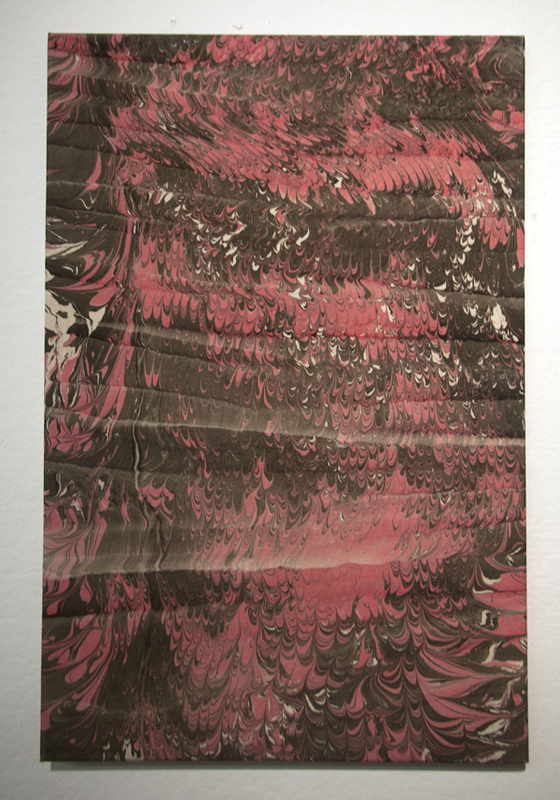 There’s five different versions of the book and there’s a piece of marbled paper dispersed randomly in each of them which is the philosophy behind how I’m displaying this work. 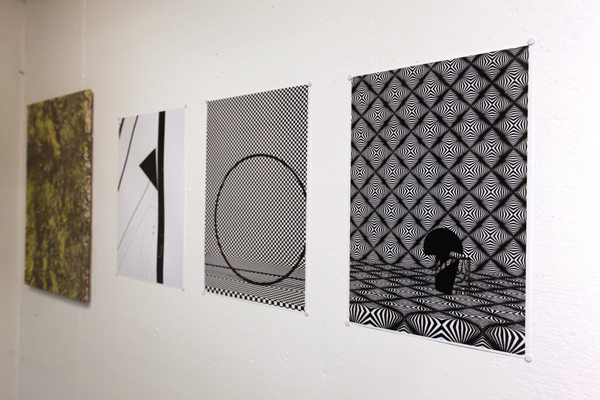 The book is similar to how I want to show this work. 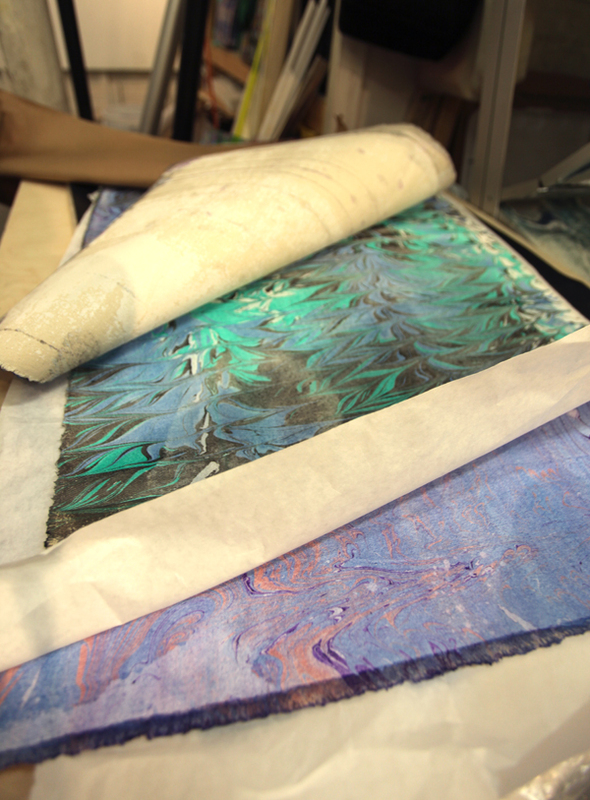 Marbled paper is traditionally used in the beginning or the end of the book. And so, I like the idea of using it to split what might originally be seen as a narrative. 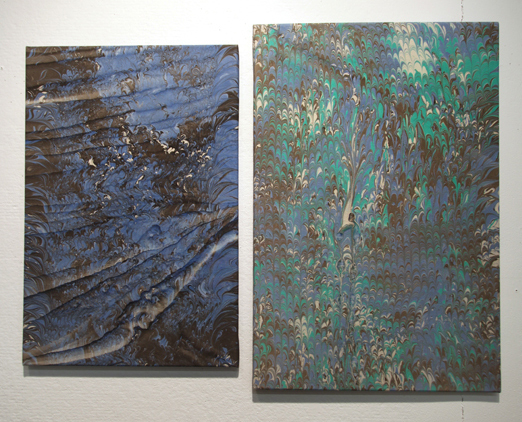 The marbled paintings with the photographs become related in their objecthood. 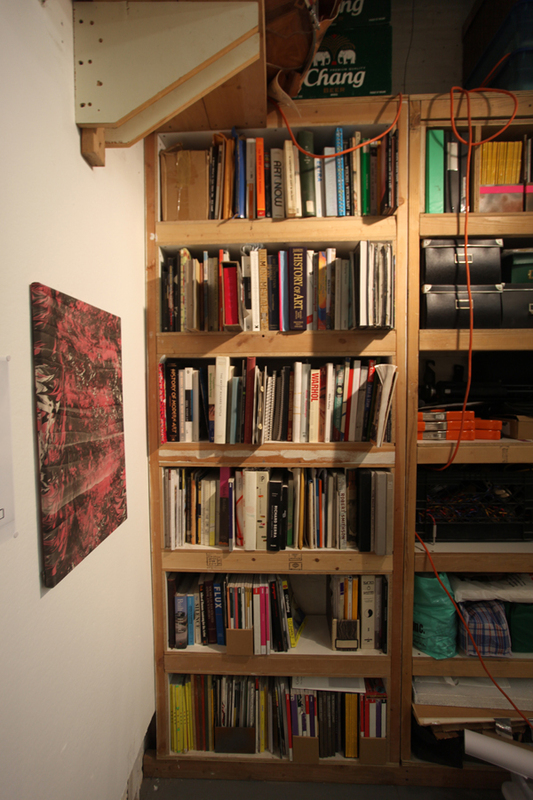 Something oscillating between the flatness of the photograph, the weight of the painting, and the book which falls somewhere in between those things. Photos courtesy of Sarah Sieradzki. F: It’s interesting because it’s a book in this kind of dying media in a certain sense. Also, in this juxtaposition between your digital work and this very traditional medium. It’s almost this jarring contradiction. SS: Immediately when you look at a photograph like this, you assume that it’s digitally rendered but it’s actually a composition of painted plexiglass forms in front of a backdrop. I’m painting and defining the edges of the plexiglass to establish some sort of form in the clear structure in front of the camera. It all starts out clear but then there’s imperfections, like paint smudges or speckled dust, that create an object established in space to what you would originally assume is digital. The precision of the manufactured design [of the fabric] is redirected through gestures in the folds that give it some humanity. So, what first appears be a cold, graphic arrangement is actually a well-defined area with actual depth and volume. 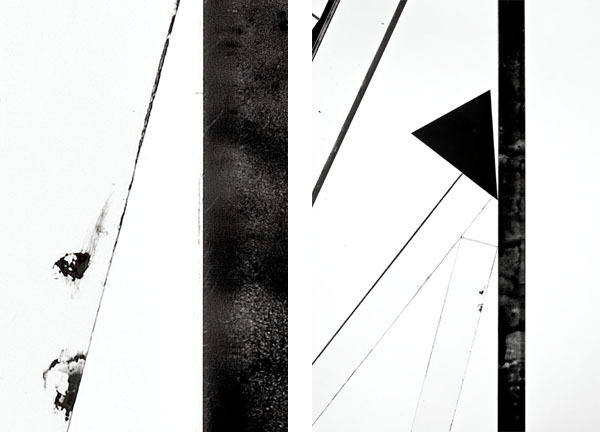 The resulting images present a space, maybe realistic only in effect, but the gravity of the elements is real. It’s this tension, between the graphic qualities of design and the revelation of what constitutes their physical form, that give the images the dignity of real space. 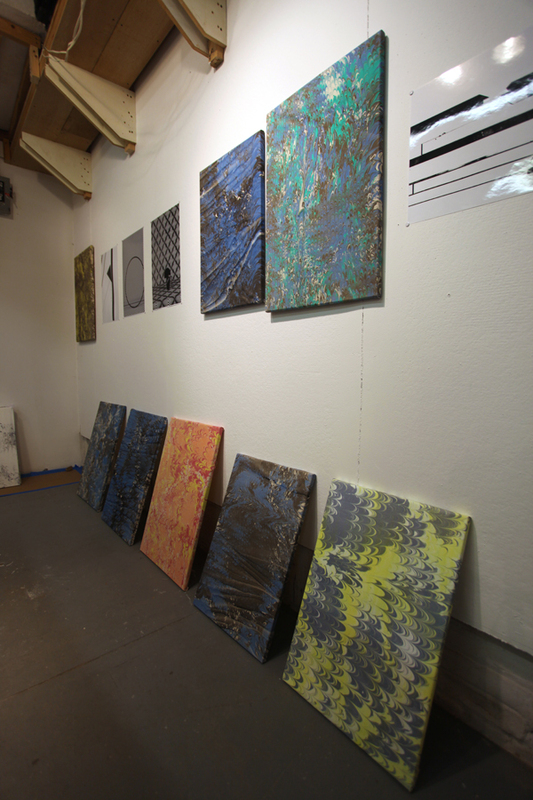 That next to a marbled painting … I think they form an interesting relationship. F: I kind of understand now, your process of photographing where you’re building these spaces but then the photograph flattens it back out. What is the reason for the different sizes? SS: They’re all the same ratio of the photographs which is 3:2. Based off of that, that’s how I made the paintings this size. 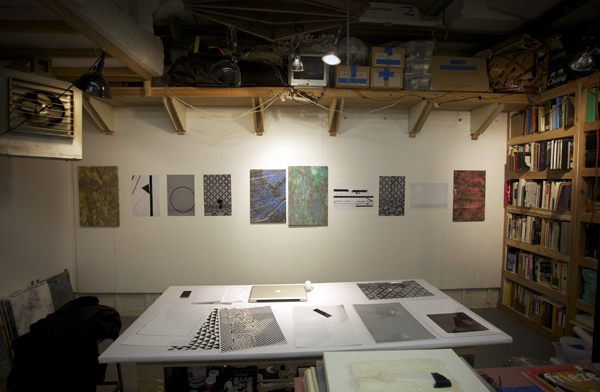 I’m also working within the size of the trays that I marble in, and of course, with the reality of the studio space. 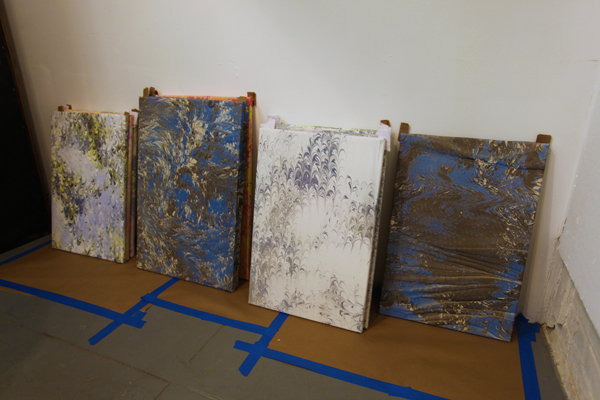 F: Can you talk about your process with your marbled paintings? SS: So I take a piece of canvas that I cut down to size. I have a tray with several gallons of gelatinous substance which is the size that I’ve prepared from methyl-cellulose. F: And you just place the canvas down into it? SS: First, you have to treat the canvas. Once it’s dry, I iron it flat, and then it’s ready to be marbled. The paint is mixed to float on the size, and I’ve made different combs to use for the pattern-making. There’s a way of doing it that makes a repetitive pattern so you can use a comb like this and you can go down and up and over and over and use another kind of comb to go over if you want to kind of mess it up. F: It’s really interesting to see this hand process lend itself to this digital pattern. It’s kind of the same vocabulary from two extremely different mediums. For these [photographs], are these textile patterns that you had found? SS: Yeah, these were both fabrics I found at a fabric store. 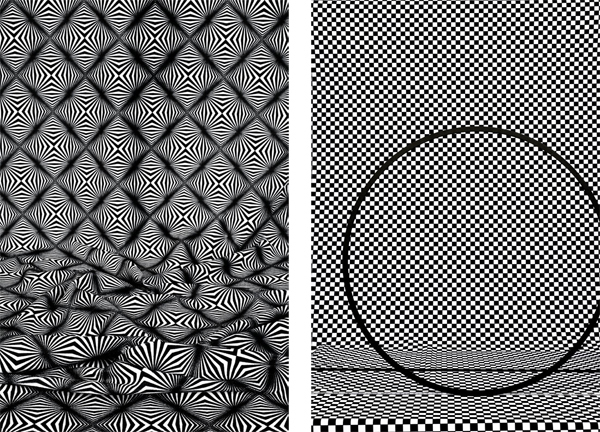 I liked these patterns because they were generic and kind of expected. F: This one reminds me of the Photoshop grid in the background when you have a translucent image. It’s like you just made that circle on Photoshop but then once you have a knowledge of it being a physical object, it immediately flips it completely. SS: Yeah, it seems like an illusion but it’s actually the reality those objects have to offer as space and as a volume within the constraints of the photograph within the constraints of the frame. That’s what I think is really interesting. It’s a similar process with marbling. It’s totally photographic in its process but there’s also a lot of mystery to it. F: I think there’s more going on with these but these seem to lend itself to be able to have something over top of it. SS: Overmarbling is an option. I never made paintings before. I stretched 20 paintings in 3 days for the purpose of getting it done and seeing it with a tight flat edge but it’s still not exactly where I want them to be. I’m going to re-stretch them and paint some of the sides because I like the idea of not having everything be the same and not having a standard. To not be able to call myself a painter, I feel like I can break the rules in a different way. Maybe if I was a painter, I wouldn’t feel like I could do that because there are so many restrictions. F: Yeah, you’re a photographer making paintings. SS: Yeah, in a way … I don’t think of myself as either/or. SS: Burn the house down? F: In a certain way, yes, definitely. You can find more of Sarah Sieradzki’s work at http://www.sarahsieradzki.com/.